The Core V2 is a powerful, almost magical piece of technology that transforms your ho-hum work laptop into a powerful gaming desktop, but that magic comes at a steep price, and compatibility issues hamper it significantly. For anyone that's been living a dual PC lifestyle, carting a laptop around for work or using separate desktops in the office and at home, a single, simple PC solution sounds like a dream. The Core V2 graphics enclosure is the most comprehensive and easy to use realization of that dream; a box that you slide a video card into that then provides peripherals, video out, and everything else you need to turn a laptop into a powerful desktop, equal to some of the best gaming PCs. While this magical transformation, all accomplished by plugging a single cable into your Thunderbolt 3 compatible laptop, may seem like the stuff of late '80s, Hasbro-born fantasy, that fantasy comes at a high price. For one, the MSRP for the Core V2 is $499—high but not outrageous pricing for such a powerful solution. The issue is that the enclosure doesn't come with any dedicated GPU solution, meaning you'll have to purchase a graphics card separately. Since the whole purpose of a graphics enclosure is to power up an existing machine, you're likely going to spend in excess of $300 on a GPU. If you're looking for a top end solution it'll be closer to the $700 or higher range for a Radeon VII or a Nvidia 20-series card, which are currently the best graphics cards. The ground floor for the Core V2 is realistically around $800, and at that price point you're starting to encroach on the cost of a dedicated gaming desktop (which, of course, assumes you already own the laptop you're going to be plugging into the enclosure). The real advantage of the Core V2, then, is that for less than what you'd pay for a desktop with the same GPU you get nearly the same experience and the best of both the static and portable personal computing worlds. There are caveats to that declaration, though. For one, our testing showed that the performance you get out of a GPU in the enclosure doesn't match up to the same GPU in a desktop. There was also a significant dip in performance when using your laptop's built-in monitor instead of an external display. With a 2018 model Razer Blade 15 attached, the Core V2 and a GTX 1080 yielded around 15-30% less performance in Shadow of the Tomb Raider and Total War: Warhammer 2 than the same GPU in a desktop, with the largest dip at 1080p settings and less at 1440p and 4K. This amounts to the loss of an excess of 20 FPS at 1080p, and around 10 FPS at 4K. The performance differences are less substantial when comparing performance on the laptop monitor to performance on an external display, but still noticeable, in the range of 7-15% drops in FPS. Since one of the main philosophies behind the Core V2 is to replace your dedicated gaming desktop it's perhaps not as crucial that it performs worse on a laptop screen, but it's certainly notable if you're buying a Core purely to give your laptop a fresh injection of graphical horsepower. 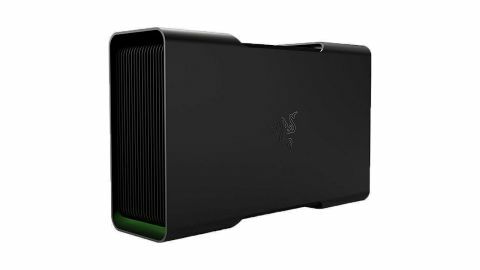 I suspect the success or failure of the Core V2 (and similarly specced graphics enclosures, either from Razer or other manufacturers) will largely depend on adoption rates for Thunderbolt 3, the connection standard the entire unit relies on. While it's an incredible feeling to plug your laptop into the enclosure and instantly get access to charging, a mouse, keyboard, wired internet, and multiple external displays, Thunderbolt 3 currently occupies a pretty niche space in the PC universe. And even if your laptop has Thunderbolt 3 ports, it's not guaranteed to work with the Core V2, as it specifically requires external graphics support from said ports, and then may require multiple updates before it's properly functional. Until Thunderbolt 3 is more universal (and as a proprietary hardware interface, there's no guarantee it will be), and until prices for external graphics enclosures begin to dip, I don't see the Core V2 reaching a broad audience. Most will opt to just buy one of the best gaming laptops instead. But for well-heeled early adopters, it's an amazing piece of technology, one of those rare gadgets that actually delivers a genuine wow moment when it all comes together and works harmoniously.